Paozu Machine DP-5000 | Daiei Engineering Co., Ltd.
Paozu (Shoronpo) machine (Model: DP-5000) automates whole processes covering the pastry wrapper forming, filling, forming into Paozu, and delivery onto conveyer. 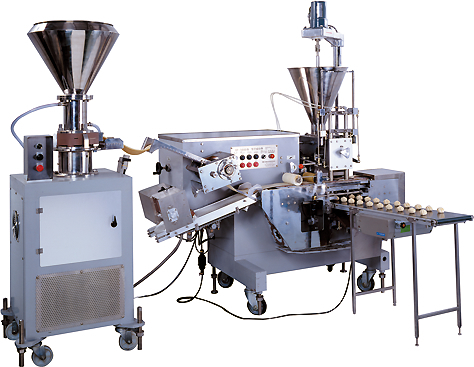 Putting the stuffing and the rolled-up pastry into the hopper and on the hunger, respectively, the Paozu machine makes pastry wrapper, fills the stuffing, then forms paozu or Shoronpo, and finally delivers them onto the conveyer. The Paozu (Shoronpo) machine accepts the use of the pastry with higher moisture, and is able to produce handmade like and tasty Paozu with soft wrapper. With change of forming attachment, this machine is able to make a variety of shape such as Shaomai, flower-type wonton (like tulip), and porch-type Paozu.